Diane Lazarus, a journalism student at Southern Connecticut State University, reported this story as part of Journalism Capstone coursework on World War I. A historic Doughboy monument outside of Milford City Hall illustrates a World War I soldier in uniform holding a rifle over his right shoulder. The city dedicated the monument on Nov. 12, 1928, in front of City Hall on 110 River St. It sits adjacent to the modern monument dedicated to the three city victims of the Sept. 11, 2001 terrorist attacks. The Doughboy stands atop a 69-inch granite base. Polio, an Italian-American sculptor from Boston, constructed many war monuments around the nation in Iowa, Ohio, Massachusetts, New York City, Virginia and New Jersey. He also constructed war memorials from other wars, such as the Civil War and Spanish-American War. On the sides of the Milford monument, plaques list over 700 names of Milford soldiers who served, including 22 soldiers who lost their lives. In 1919, one year after the war ended, the Woodmont Association and the city erected honor rolls in memory of those who arrived home and died overseas. Then, nine years later, the granite Doughboy monument was dedicated in front of City Hall. Milford has a collection of monuments on the city green representing other wars in which America was involved. 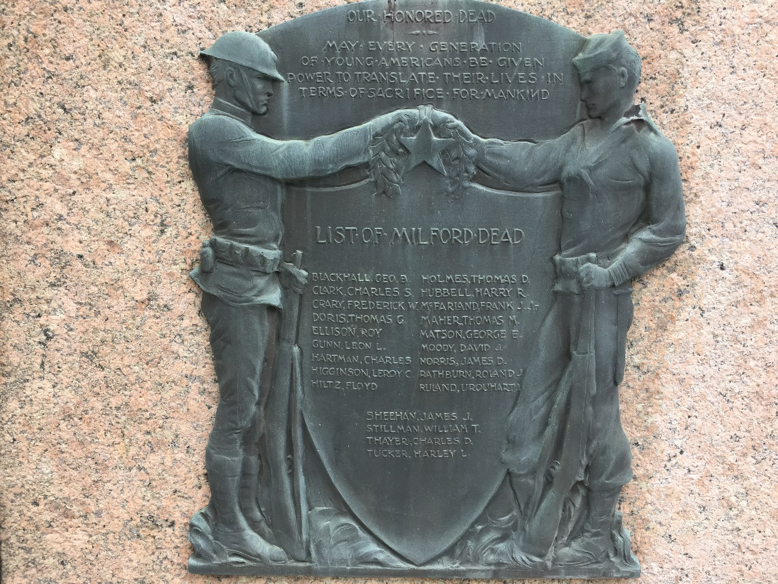 Ardienne Damicis, of Milford’s Historical Society, said the group has annual exhibits and events in remembrance of World War l.
To view a full list of names on the monument, click here to open a PDF file.